What could be a better british holiday than a holiday in a luxury cottage in Wales. 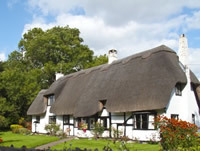 There is a wide range of cottages in Wales to choose from. Some are in remote country locations, others are in busy towns and cities and others are set in locations by the sea. With 5227 holiday cottages to choose from you are sure to find the perfect british holiday in Wales. Ground floor: 1 twin bedroom with additional sofa bed en-suite shower room and toilet. Games room. Utility room with sauna. Separate toilet. First floor: Living room with sofa bed. Dining room. Kitchen. 2 bedrooms: 1 double with sofa bed 1 twin (2ft 6in for children). Bathroom with shower over bath and toilet. Ground floor: Living room with wooden floor. Dining room/kitchen. Utility room. Separate toilet. First floor: 2 bedrooms: 1 double (5ft) 1 twin. Shower cubicle and toilet. Second floor: 2 double bedrooms (one 5ft). Shower room with toilet.